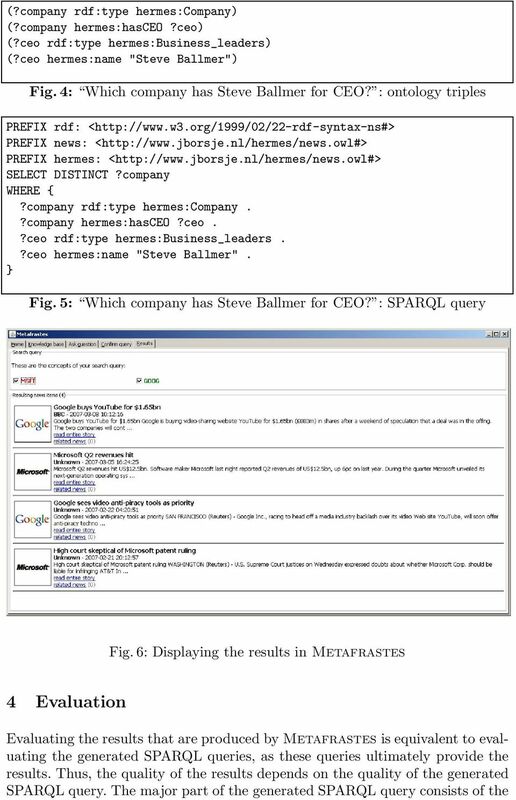 Download "Metafrastes: A News Ontology-Based Information Querying Using Natural Language Processing"
3 the original Masque (Modular Answering System for Queries in English) system, which was focused on working with Prolog queries on Prolog databases. The Masque system, which was developed at the Artificial Intelligence Applications Institute and the Department of Artificial Intelligence of the University of Edinburgh, strives to combine extensive linguistic coverage, efficiency and portability. Moreover, it was also developed to be easily configurable for different knowledge domains. AquaLog  is a question-answering tool that takes an ontology and a natural language query as input, after which it returns an answer from the ontology. The natural language queries are translated into logical queries, which are interpreted with respect to a given ontology and the corresponding semantic markup. Being an ontology-compatible system, AquaLog strives to work with Semantic Web technologies only, thereby trying to be as portable as possible by making use of the ontology standard representation languages. SemNews [9, 10] is a semantic news service that monitors different RSS news feeds and provides structured representations of the meaning of the news items that originate from these news feeds. It strives to make more Semantic Web content on the Web available by extracting summaries from RSS descriptions of news items and by processing this natural language input using an underlying component called OntoSem. 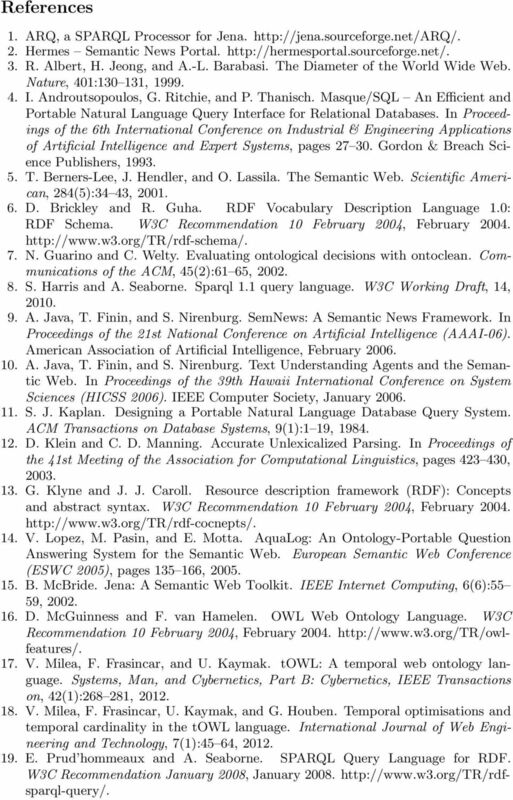 In deciding the usefulness of previous approaches for our current endeavour, we define four criteria that these approaches should fulfil: i) Semantic Web foundation or orientation, ii) ability to answer natural language questions, iii) ability to deal with news items, iv) use of an intermediate representation. Table 1 provides an overview of the related work that was discussed in this section, along with the four criteria that we deem relevant. 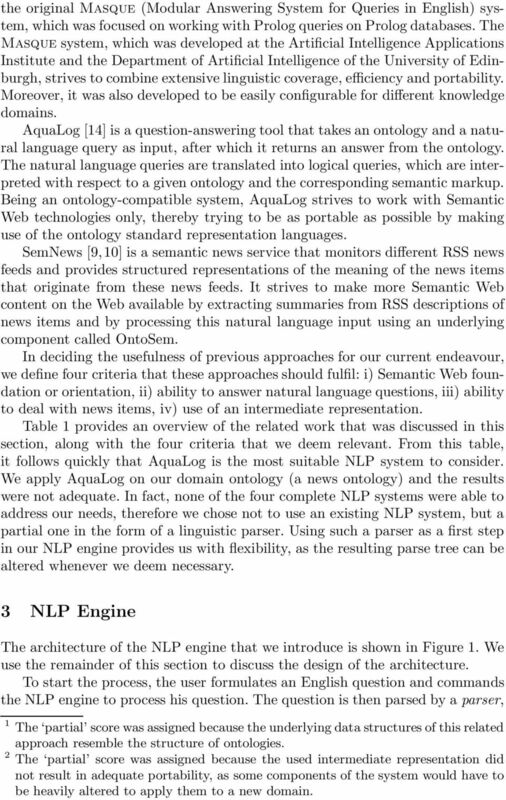 From this table, it follows quickly that AquaLog is the most suitable NLP system to consider. We apply AquaLog on our domain ontology (a news ontology) and the results were not adequate. 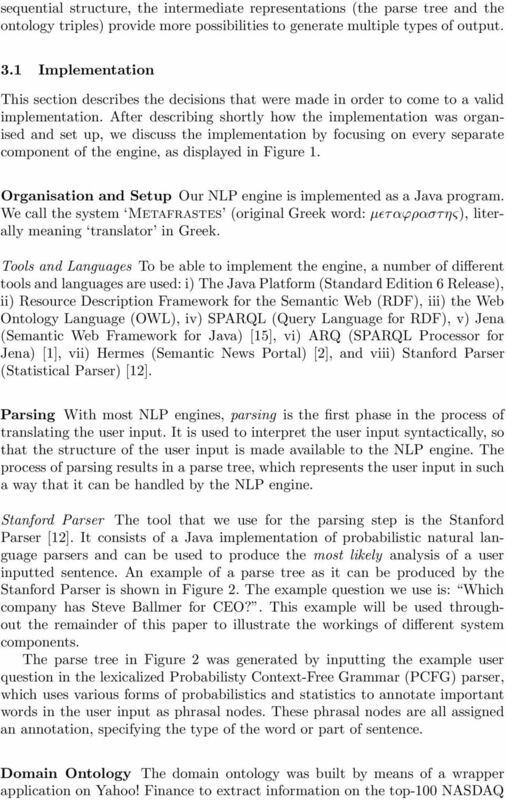 In fact, none of the four complete NLP systems were able to address our needs, therefore we chose not to use an existing NLP system, but a partial one in the form of a linguistic parser. Using such a parser as a first step in our NLP engine provides us with flexibility, as the resulting parse tree can be altered whenever we deem necessary. 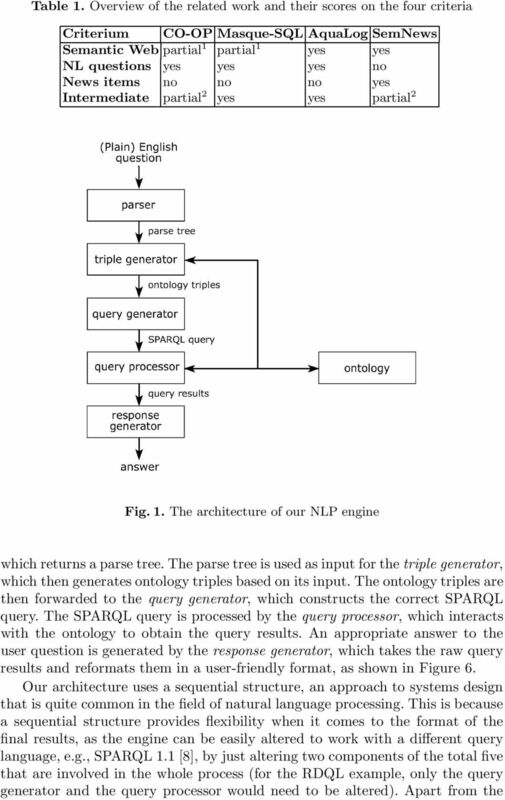 3 NLP Engine The architecture of the NLP engine that we introduce is shown in Figure 1. We use the remainder of this section to discuss the design of the architecture. To start the process, the user formulates an English question and commands the NLP engine to process his question. The question is then parsed by a parser, 1 The partial score was assigned because the underlying data structures of this related approach resemble the structure of ontologies. 2 The partial score was assigned because the used intermediate representation did not result in adequate portability, as some components of the system would have to be heavily altered to apply them to a new domain. 7 produce a suboptimal solution for a complex problem. The heuristics developed for our system are shown in the algorithm depicted in Figure 3. The heuristics take the parse tree as input, which was the result of the previous step in the question translation process. Then, on lines 1 and 2, two variables are assigned. The variable currentterm keeps track of the current term in the parse tree, while keywords is used when a request for news items needs to be discovered. From line 3, we check whether the user asked for news items in his question. If so, the value of currentterm is updated with the news item term. The if tag on line 6 determines whether there are relations linked to the news item term. If so, the currentvalue variable is updated again and ontology triples are added for this relation. This step repeats itself, but now a link between the current term and an ontology concept is searched for. If this is found, the ontology triples are again added and next to updating currentterm, the previous term is stored. 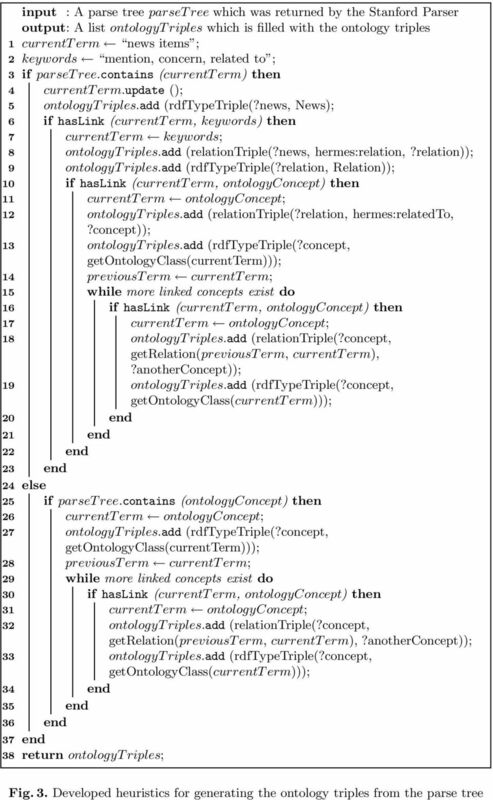 After that, we check whether there are any links to ontology concepts in the remaining leaves of the parse tree. If this is so, ontology triples are added for every link to an ontology concept that exists. If no links are present, a final triple is added (the synonym triple), after which the ontology triples are returned. If the user did not ask for news items, the algorithm skips to line 22, where we check whether the parse tree contains an ontology concept. 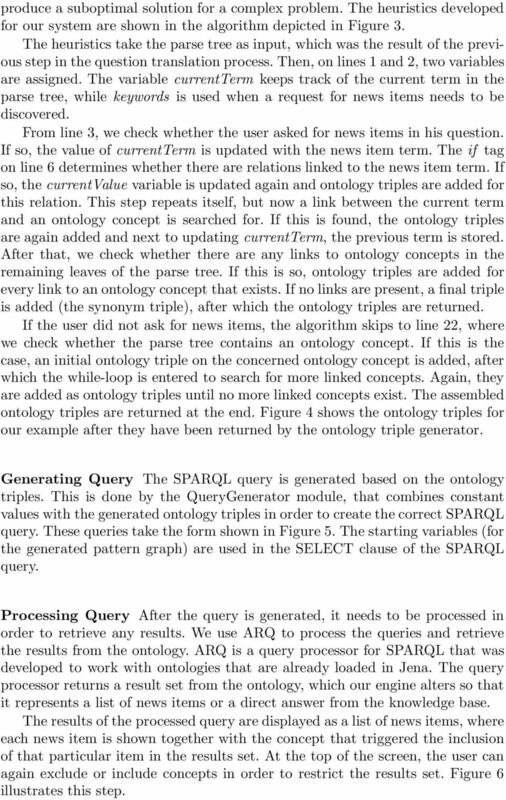 If this is the case, an initial ontology triple on the concerned ontology concept is added, after which the while-loop is entered to search for more linked concepts. Again, they are added as ontology triples until no more linked concepts exist. The assembled ontology triples are returned at the end. 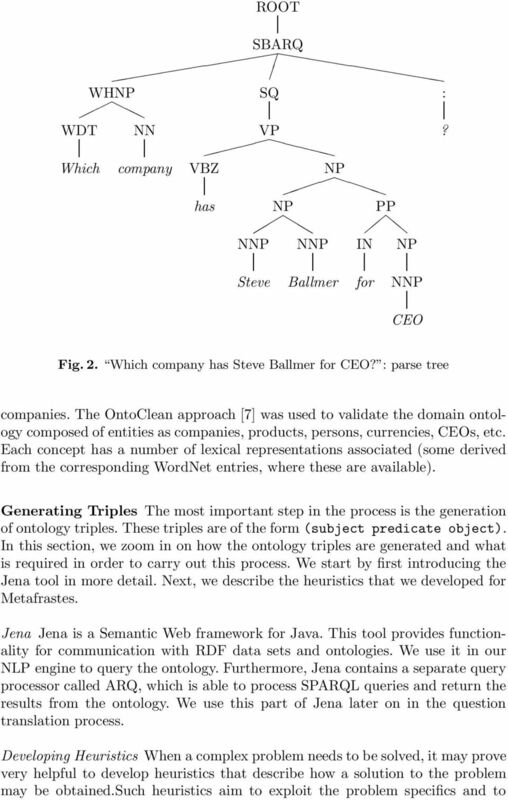 Figure 4 shows the ontology triples for our example after they have been returned by the ontology triple generator. Generating Query The SPARQL query is generated based on the ontology triples. This is done by the QueryGenerator module, that combines constant values with the generated ontology triples in order to create the correct SPARQL query. These queries take the form shown in Figure 5. The starting variables (for the generated pattern graph) are used in the SELECT clause of the SPARQL query. Processing Query After the query is generated, it needs to be processed in order to retrieve any results. We use ARQ to process the queries and retrieve the results from the ontology. ARQ is a query processor for SPARQL that was developed to work with ontologies that are already loaded in Jena. The query processor returns a result set from the ontology, which our engine alters so that it represents a list of news items or a direct answer from the knowledge base. The results of the processed query are displayed as a list of news items, where each news item is shown together with the concept that triggered the inclusion of that particular item in the results set. At the top of the screen, the user can again exclude or include concepts in order to restrict the results set. Figure 6 illustrates this step. 11 list of 9 custom questions. They are questions that we came up with, regardless of the structure of the ontology. Moreover, we tried to act a bit like layman users ourselves, resulting in questions that are not always formulated in a clear way. Table 3. Some custom user questions and their translation scores # Question Translation C1 When was YouTube bought by Google? Incorrect. C2 Which companies have recently experienced a CEO switch? Incorrect. C3 Give me the names of all software companies. Incorrect. C4 Is Google situated in the Netherlands? Incorrect. C5 Does Larry Page work at Microsoft? Incorrect. C6 Which CEO works for Adobe? C7 iphones are great. Where can I get one? Incorrect. C8 Who is the CEO of Motion in Research? 1 C9 What does Apple do? Incorrect. 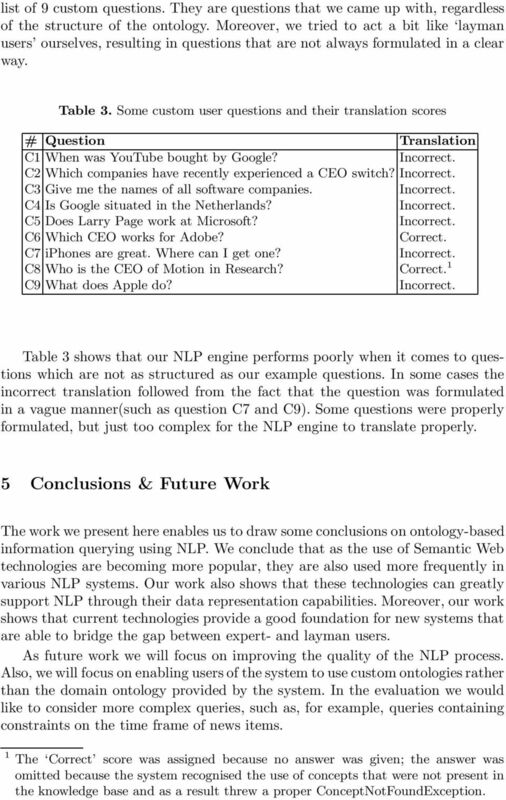 Table 3 shows that our NLP engine performs poorly when it comes to questions which are not as structured as our example questions. In some cases the incorrect translation followed from the fact that the question was formulated in a vague manner(such as question C7 and C9). Some questions were properly formulated, but just too complex for the NLP engine to translate properly. 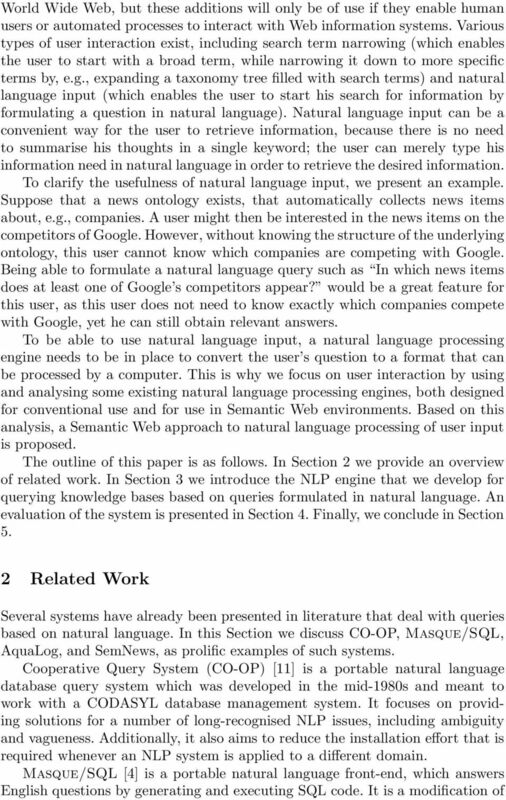 5 Conclusions & Future Work The work we present here enables us to draw some conclusions on ontology-based information querying using NLP. 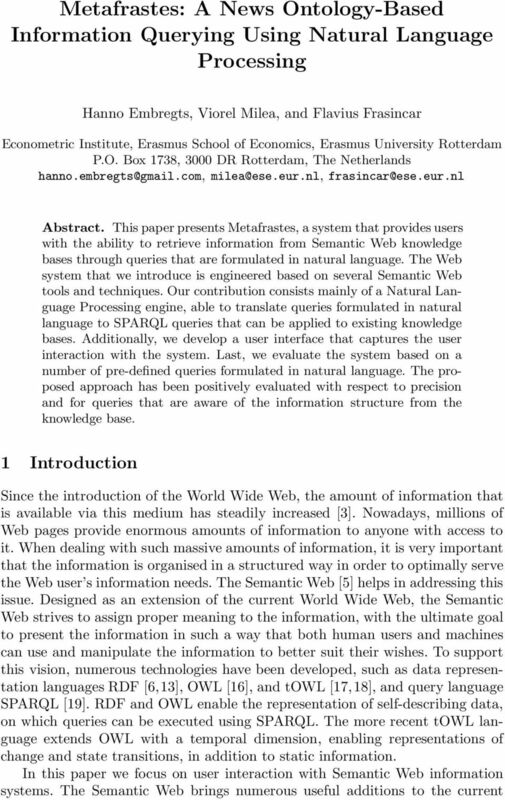 We conclude that as the use of Semantic Web technologies are becoming more popular, they are also used more frequently in various NLP systems. Our work also shows that these technologies can greatly support NLP through their data representation capabilities. Moreover, our work shows that current technologies provide a good foundation for new systems that are able to bridge the gap between expert- and layman users. As future work we will focus on improving the quality of the NLP process. Also, we will focus on enabling users of the system to use custom ontologies rather than the domain ontology provided by the system. In the evaluation we would like to consider more complex queries, such as, for example, queries containing constraints on the time frame of news items. 1 The Correct score was assigned because no answer was given; the answer was omitted because the system recognised the use of concepts that were not present in the knowledge base and as a result threw a proper ConceptNotFoundException.